What is the “sell” ability of your business? The following information will provide you with useful insight and basic guidelines for improving your company’s sell-ability. The Sell-Ability of your business can largely be based on the industry, your competition, current and future growth, product/service lifecycle, and many other factors. Additionally, there are countless valuation methods that will vary by industry and more importantly, the size of the business. 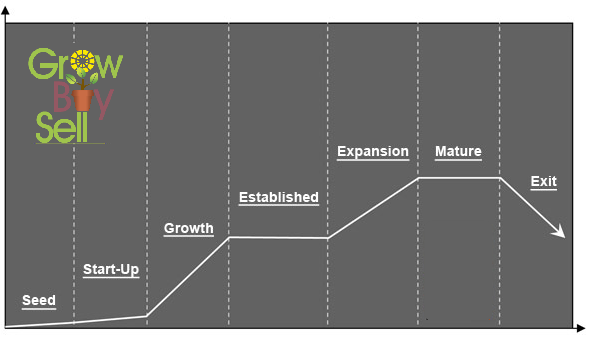 There are 7 stages to a company’s lifecycle. Knowing what stage your company is in is important to improving your company’s value. Your business is either Growing, Plateauing, or Declining. If your company is declining, you are either downsizing or losing marketshare. Either way, you need to establish a plan to level off and re-grow or you need to determine your exit strategy. Most businesses that go down this road, unfortunately, fail to plan and simply close their doors. Some company’s simply need to ask for help to get back on track so that when the time is right, they can exit with style and grace (maybe sell their business for a nice profit). If you have an established business that has fluctuating profits, than your business may simply need to adjust its methodology or create a new marketing plan. Also, you should closely examine your business and determine if you’re actually in the established (ready to expand) stage or if your product/service is in a mature stage (few new opportunities). In the world of venture capital they have a saying, “Growth drives value”. 1. Predictability: Customer retention. How many customers of yours did you retain from last year or the year before? Are they spending the same amount of money or are they spending more or less? This is part of your product lifecycle – Can you think of new products that your current customers will want? Put another way, are your products “good to have” or “must have products”? 2. Profitability: Look at your top 5 products/services and determine which products are the most profitable. An auto manufacturer makes a good profit on selling the car, but makes a bigger profit on selling its parts. A better example is the printer industry: $100 printer will cost you $400 a year in ink. At one point, this was 60% of Hewlett Packard’s profit margins. Businesses that receive the highest multipliers for business valuations often have business models that generate gross margins above 70%. 3. Diversity: Many companies generate 80% of their revenues from 20% of their customers. Those customers are great for business, but do not help your valuation. A business will yield a much higher value if the top 5 customers produce a healthier 15% or less of the companies revenue. Insuring that your company has diverse supplier support, is similarly important to insuring that your revenues come from multiple sources. If you lose just one supplier, how will that effect your revenues? Okay, you built your business from the ground up. You know every detail and every nook and cranny. It’s now time for you to train your staff to do what you do. Think of your business as an investment, rather than a job. Invest your time now, make your policies and procedures easy to teach, and have someone else do it for you. Similar to your retirement plan, you contribute money now so that later the money will contribute to your retirement. People that buy a business view it as an investment of money first, and their time second. Not many business buyers want to work long and hard in their new business just so that they can spend less on the purchase price. A buyer will factor risk vs. reward to determine if your business is a sound investment.